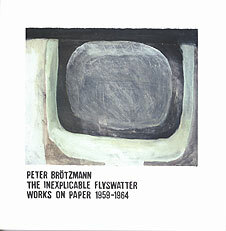 This 48-page book was published as a catalogue for an exhibition titled Peter Brötzmann: The inexplicable flyswatter: works on paper 1959-1964 held at 1926 Exhibition Studies Space, School of the Art Institute of Chicago, 7-28 March 2003, and at Woodland Pattern Book Center, Milwaukee, Wisconsin on 1 April - 18 May 2003. The book contains an essay by John Corbett on Brötzmann's visual art, together with the transcription of a discussion between the two men on the same subject held in June 2002. The remaining 26 pages consist of colour plates of different takes by Brötzmann on the (humble?) flyswatter. Tracks 2 and 4 performed by Peter Brötzmann, alto saxophone; Horst Prehn, alto saxophone; Peter Kowald, bass; Gerd Panzer, drums. Recorded in Bremen in November 1965.